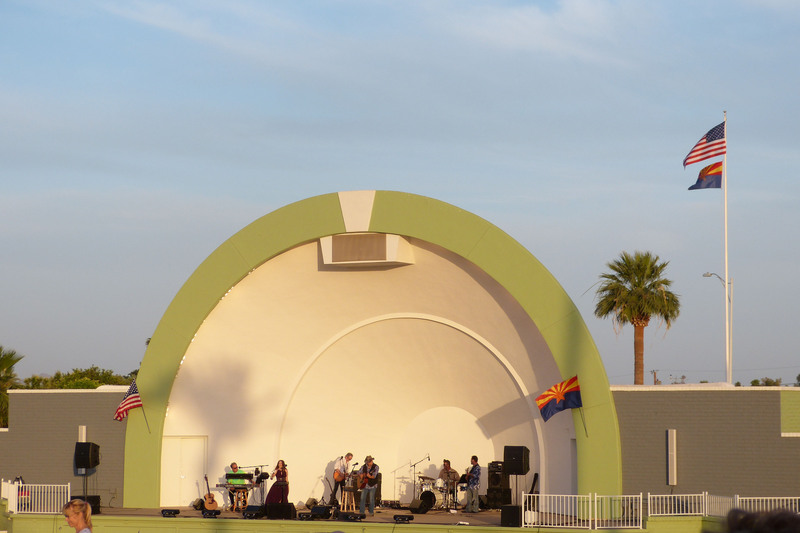 Sun Bowl Amphitheater - Sun City, Arizona - The Original Fun City! 10220 N. 107th Ave. For a recorded message regarding venue change in the event of inclement weather, call 623-972-6014. When necessary, shows are moved indoors to the Sundial Auditorium. The Sun Bowl, an open-air amphitheater, is Sun City’s premier entertainment venue. Every spring and fall it plays host to numerous concerts, performances and other events. The complex is situated on approximately 9.1 acres which includes a regulation softball field in addition to the amphitheater. As a courtesy to others, there is no smoking in the Sun Bowl. Smoking areas are located in the adjacent parking lot. Sunday Night shows at the Sun Bowl are FREE to all RCSC Cardholders and their escorted guests only. ** Please be prepared to show your RCSC Member or Privilege Card (with photo, no key fobs accepted) to gain entry to shows. Gourmet food vendors are on-site 1–1/2 hours prior to show times for your dining pleasure. Bring your lawn chair or blanket. Please note that early reservation of seating space is not allowed and that chairs nearest the stage are reserved for those individuals arriving by buses only. Your cooperation is greatly appreciated. For additional information about Sun Bowl concerts and events, please contact the Clubs & Activities Office at 623-561-4660. Should the weather dictate that the show be moved indoors, concerts will be held in the Sundial Auditorium located at 103rd Avenue and Boswell Boulevard. For a recorded message regarding any venue changes, please call 623-972-6014.